Dakota (AKA VJ’s Honeybunch), my eight year old blue brindle male, has a problem: severe thunderstorm phobia which has almost, on several occasions, resulted in his death. During thunderstorms, Kody drools, pants, whines, and paces. Two years ago, however, this fear escalated into his getting out of the house via the dog door, jumping my six-foot stockade fence, and running for several miles during severe storms. Fortunately, he avoided being struck by a car and was rescued. Kody has, at times, jumped onto counters and/or tried to dive through windows. Needless to say, these events were extremely traumatic for both Kody and me. I’ve tried several methods of dealing with this phobia, including: Bach Flower Remedies (i.e., Rescue Remedy), Phosphorous 30-C (a holistic remedy), Tellington touch, distraction, desensitization with a thunder tape, and large doses of Valium (actually up to 20mg one day), with no effect. Nothing helped. Obviously, it became time to seek professional help, because Kody seemed destined to certain injury or death if I couldn’t find a way to abate his fear response. After reading Dr. Nicholas Dodman’s book The Dog Who Loved Too Much which discusses the psychology of dogs and treatment of various types of behavior problems and phobias, I realized it was time to pay him a visit at Tufts Veterinary School’s Behavior Clinic in North Grafton, MA. Dr. Dodman himself did the evaluation. A reporter from either USA Today or US World/News Report, as well as Dr. Dodman’s resident, Dr. Jean DiNapoli, and a visiting vet from Japan, were also present during the 1-1/4 hour visit. We spent some time just chatting, and he observed and took notes on Kody’s demeanor around me, my friend, himself and the reporter. For those who read his book, you will find many of the same suggestions mentioned here. Dr. Dodman’s impression was that the purpose in bringing Kody to his clinic was “to save Kody’s life,’ since he believes that the behavior is going to continue to escalate. He believes that a multi-faceted approach to thunderstorm phobia has a very good chance of improving his behavior, although probably not eradicating it. Dr. Dodman says that, typically, thunderstorm phobia seems to escalate between ages 5-8. A stable fear or phobia may leap in trajectory during this age window. Sometimes, separation anxiety is a component of this increase in severity. We didn’t think this was a factor with Kody. Increase the amount of exercise, particularly on days when storms are due. 20-30 minutes/day of AEROBIC exercise (not just idle walking) will go a long way toward keeping his energy level —and his anxiety— down. Exercise increases serum seratonin level, which in turn acts as a mild, natural sedative. Feed a good-quality, limited protein, preservative-free dog food. (I do already) He specifically suggested Nature’s Recipe Lamb & Rice (16% protein according to him, but I checked the food out on the way home, and find it’s 20%, vs. the 23% he gets on Exceed Lamb & Rice presently). He suggested changing the food gradually over 3 days and that if I don’t see a change in behavior within about three to five days, that I should go back to the regular food. I guess this particular protein adjustment has variable effects on different animals. Use obedience training. Dogs not obedience trained should be obedience trained. The training makes dogs more confident in general. Phobic dogs in particular need the feeling of safety that obedience training gives to help allay their phobias. Dr. Dodman saw that Kody and I have a good relationship and no dominance issues, so in our case, there’s not much work to be done in this category. Remain upbeat. Have a happy manner during thunderstorms but keep an authoritative attitude. Give no sympathy. During storms, ask him to respond to obedience commands. Use his favorite treats and a high, enthusiastic voice, to get him to learn to associate storms with pleasurable act ivity. Adopt an attitude of “cheerfulness and leadership.” Do a “convincing acting job” even if feeling nervous. Don’t communicate nervousness or anticipation to him. Be sure to generalize the training to all rooms of the house, or he will become conditioned to one room and continue the phobia response in all others rooms. Use systematic desensitization with counter-conditioning. This means giving food treats to make him associate storms with good things. The trick is to not expose the dog to the fear while in the process of desensitizing. Thus, thunderstorm season is a bad time of year to try this. I might attempt it during a window of low-humidity, storm-free days. You must use a tape recording (or CD) that the dog is actually afraid of in order to accomplish conditioning. Start the tape very softly. Look for just the slightest ear twitch or response to the thunder (not an out-and-out fear reaction). Hold that level. A day later, start out again at the same level, then increase the level very slightly until, again, another ear twitch. Continue until at full volume. You want to override the fear. Look for the subtle behavior changes (ear twitch, etc. ), then immediately do obedience and distract. Give lots of good treats and reward verbally. Do this for twenty minutes at same volume. Finish the lesson on a good note. If he is happy with the tape running, walk out of the room and leave the tape on for a few more minutes. Build up to being able to walk out of the house for five minutes with the tape on, then fifteen minutes, and longer, so that he can tolerate storms while you’re out of the house. This process needs to be repeated at least weekly for rest of his life! There is still debate about whether this is even effective with thunderstorm phobic dogs. The fear is felt to be multi-phobic: there may also be components of static electricity, change in barometric pressure, even a subtle change in scent that dogs discern (although we don’t). Take anti-static measures. How? By putting dog on a hard-surfaced, conducting floor, especially one with tile. Dr. Dodman has found that every dog he’s met who hides in a bathtub has been thunder-phobic. In addition, he has never seen a phobia other than thunderstorms send a dog to the bathtub, shower, or Jacuzzi. The doctor suspects static to be the rigger for this reaction. Wetting the dog down with a plant mister or a wet towel will cut down on static electricity. Ahhhh, the meat of the matter. The main medications used are Clomipramine (tricyclic antidepressant) and Prozac. We’re going to use Prozac. The usual dosage is 1 mg/kg, but he’s making the dosage lower because of Kody’s breed: 20mg daily. 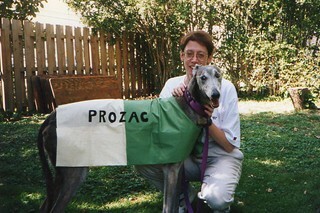 (a kg = 2.2 Lbs; Kody weighs 76.1) Prozac is generally a very safe medication. Some occasional side-effects may be: barking, mild agitation, anorexia (loss of appetite) about 3-4 weeks into therapy, and/or transient sluggishness. These side-effects are usually short-lived, as they are in people. We will not use the Prozac until Kody’s blood work (a complete CBC and Thyroid Panel) results are returned. Another therapeutic option would be Clomipramine in combination with Tranxene, which is a long-acting benzodiazapene (Valium family): the former to decrease anxiety levels, the latter to be used only on storm days. Kody received a prescription for XANAX (2 mg) to be used before storms (30-60 minutes before), as this has been shown to be much more effective for phobias than Valium. A study by CIBA-GEIGY showed that Xanax given orally for acute anxiety was as effective as when given intra-venously, so clearly it is a better choice for immediate alleviation of phobia. I will be getting a call from his resident in two, four, and eight weeks as part of the routine. The doctor encouraged me to call with any questions, comments, concerns, improvements or worsening in behavior. He also gave me a rating sheet to fill out on days with thunderstorms. My instructions were to annotate Kody’s reaction to the storms: minus 1 for very bad to +4 for great improvement. He feels we can get at least a “+2”, and perhaps even a +3- +4 with the combination of therapies. A +2 is considered 50% better. Can Thunderstorm Phobia Be Cured? Dr. Dodman has had only two complete cures using all the above steps, combined with medication. He joked about putting on one of those rubber static strips they use on trucks and busses! (hang it from the tail, I suppose…) His other suggestion was to put a choke collar on him and let it hang to the floor, but I told him I thought that was an accident waiting to happen! No way, Jose! The visit with Dr. Dodman was very cordial and informative. Let’s hope it helps! I’d also encourage anyone with a similar problem to read his book. No, I’m not an employee of his pblishing company! I just think his ideas are novel and may offer hope in the face of an otherwise intractable problem. Kody was put onto Prozac, which was to be used throughout all of the thunderstorm season. He was also prescribed Xanax, a fast-acting benzodiazeprene (a tranquilizer) in the Valium family to use during the actual storms. A behavior modification program was outlined, which has been difficult if not impossible to follow, since you really need a large window of time in which to carry out the program without any storms interrupting the progress. Here in New England that is an impossibility during the summer months. I wish I could report a more positive outcome; the improvement has not been as significant as I had hoped. The night after seeing Dr. Dodman, Kody attempted to jump through a window in the midst of a severe storm. This occurred despite a large dose of Xanax. After several trials of Xanax, and after waiting an adequate amount of time for the Prozac to take effect (four to six weeks), I found that even a megadose of Xanax wasn’t relieving his panic response. I spoke with Dr. Dodman, who suggested stopping the Xanax and using Inderal (Propranolol), a beta blocker. This medication slows the heart rate, drops the blood pressure, and lowers the “fight or flight response” that Kody experiences during a storm. He is given 40mg of Inderal at least one hour before a storm when possible. This seems to eliminate his more violent behavior, although he continues to pant, salivate, drool and hyperventilate as he did before treatment began. He is bonding more strongly to me during storms and remains by my side instead of running through the house frantically. However, last week, while loading Kody into the car as a thunderstorm began, Kody tried to jump through the six-inch opening in the rear window . . . So we obviously have a ways to go! Once the thunderstorm season ends, it will be time to begin an intensive desensitization program with the thunder tapes, playing the tapes daily at an increasingly louder volume. I hope this program will help lessen the severity of his reaction to storms next year. I’ve also been fortunate to find a friend who is able to keep him in her grooming parlor on days when storms are predicted, so I know he will be safe while I’m at work. I still listen to three weather forecasts a day and watch Kody like a hawk as soon as a cloud appears in the sky. I confess to being disappointed that we haven’t found the ultimate cure as of yet, but we’ll continue to work on it in the upcoming months. I have to say this: Kody certainly keeps life interesting! 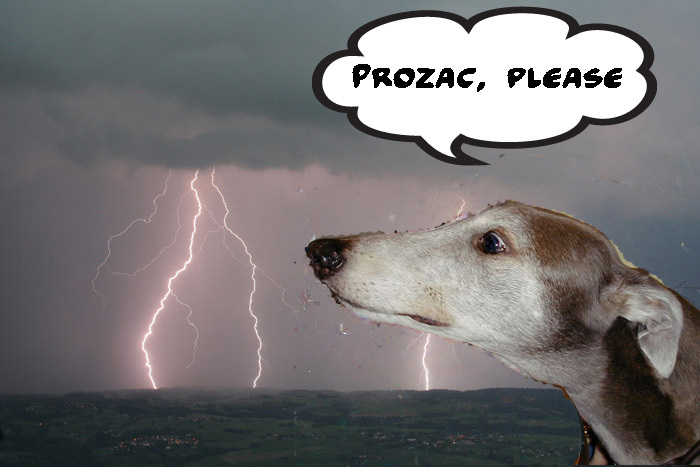 The final conclusion: Inderal was far more helpful than the Prozac, but Kody always had some degree of thunderstorm phobia. Ed. Note: Since this article was written inventors have come up with thunder capes and jackets. These are very effective for some dogs. The swaddling effect of the jacket is especially comforting and is worth a try. We have tried aprazalom and it works fairly well if given 30 minutes before the storm arrives. Some have used valium. Please do not use acepromazine, a common “calming” medication. 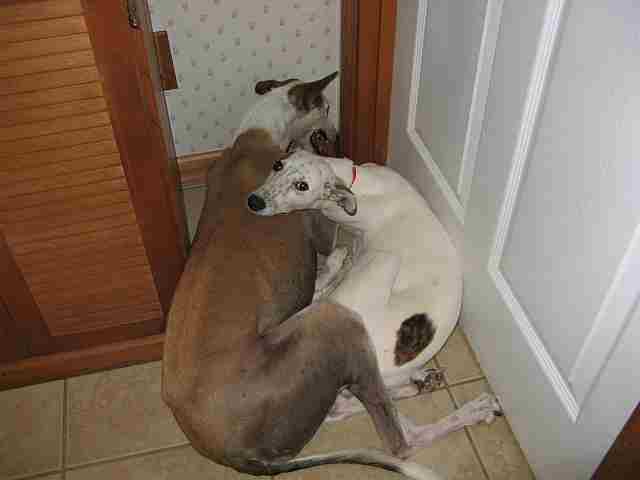 Jordan Graustark lives in New Hampshire has been a longtime guardian of greyhounds, galgos, and Italian greyhounds. I have a thunder phobic boy and also a noise phobic boy. We left the Ca desert where there was no thunder to move to the East where thunder was a common occurance. After Wayne attempting to jumo out the window, I knew it was time to see the vet for something stronger than the natural remedies. The vet we saw has had success with Ativan so we are trying it. I’ve not heard of it being used for dogs and the jury is still out as to its effectiveness. It did help Lenny a bit however not so much with Wayne. I did under dose by 1mg as it was the first time using it. Dear Readers, There is a wonderful thread on the Greyhound Gurus site, the sister site to this one. Many things work for thunderstorm phobia. In our case we found that alprazalom has worked when nothing did after 5 years of trying. We also have two DAP diffusers plugged in our house during T-storm season. Looks for it in “Recent Posts” in the right sidebar. Excellent info Jordan. I’ve spoken to the vet regarding the Inderal and he’s more than happy to write a script for me to try it on the boys. Thank you for the tip, Carol! I know many of us are looking for something to calm our thunderphobic and fearful dogs. Our Rita (also 61#)is the same way and so far, the only thing that helps with T-storms is covering her up — with a dog bed! She’s nervous at events too, so this is a double boon. She really likes people but high-energy places make her nervous. Maybe she can start enjoying herself more when we give this a try. my thunder-phobic gal is Calif Princess who spent her farm time in Oklahoma and raced in Florida….both major thunderstorm areas. Her best “cure” was to retire in California where thunderstorms seldom occur. Although, the first time we had a thunderstorm, I figured out why her trainer called her the Spanish word for thunder…she became a shivering heap in a dark corner. Now, should we have a fear-invoking event (thunder, hubby trimming trees with the accompanying racket, meet & greets, etc. ), 4 mg of Alprazlam takes her 61# body to a much better “place”. It is fast-acting sedative so we can dispense on an as-needed basis and not be tied down to regular dosing.